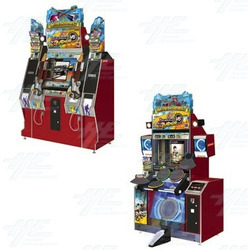 Includes Guitar Freaks V6 and Drum Mania V6 machines. Both machines feature over 500 songs each, making them the largest collection of Guitar Freaks/Drum Mania so far. The songs comprise a wide range of genres including rock and pop. The machines can be linked together, with up to three people able to play together simultaneously in Session Mode. The machines can be linked together, with up to three people able to play together simultaneously in Session Mode.